This year several members of the Conclave paid a visit to Cumbria for a couple of days. of poor management and the Black Death contributed greatly to its downfall, and it was dissolved by Henry VIII in 1537. 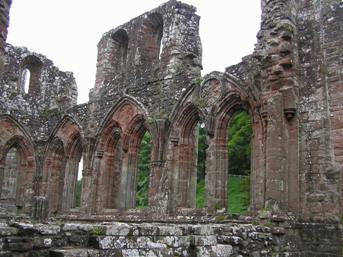 The Abbey now lies in ruins but is a popular tourist attraction, managed by English Heritage. cap off the afternoon, Dianne produced a stunning cake with the Cross of the Order as the centrepiece – delicious! 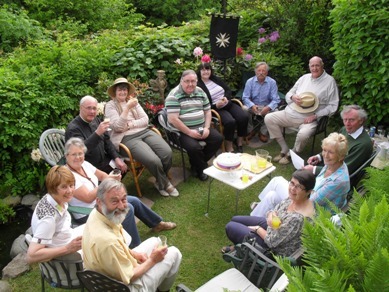 In the evening we all gathered again in the nearby village of Broughton-in-Furness for our evening meal. Such is the local spirit in these parts that the local restaurant, Beswicks, opened especially for us, and we had a lovely evening with great food and drink. Accommodation for the group was kindly provided by Barry and Dianne, and also by Ken Shipman, who has a large house in the village. We were all grateful to them for their kindness and generosity in arranging this for us. 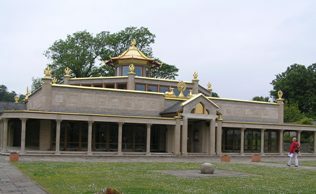 To maintain the togetherness, we all met up in the local cafe for breakfast, before making our final visit to Conishead Priory, in Ulverston, where we also visited the Manjushri Kadampa Meditation Centre. All in all we had a wonderful weekend of fellowship, religion and we all learned more about each other as well as some of the history of the area. Many thanks to all those who helped with the arrangements.